Do you want to become master at using Gmail? Well, browse through cool Gmail tips to get started. Google has put up special webpage showcasing different Gmail tips and tricks to perform Gmail chores more quickly. There are different levels of difficulty to get handy with Gmail tips like: white belt, green belt, black belt, Gmail master. 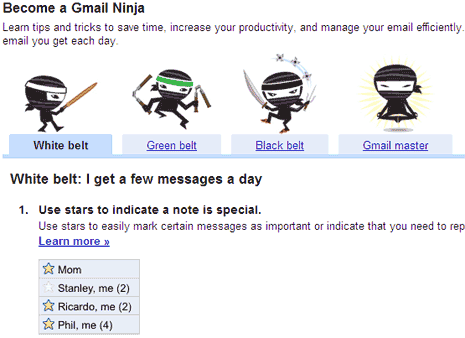 Head over to Gmail.com/tips [via] to access all Gmail tips you would need to become Gmail Ninja. Read and practise few tips daily and master the art of using Gmail like never before. You for sure will discover new ways to manage email using Gmail.